Why do issues like prostate problems (for men), prolapse (for women), incontinence, and pelvic pain disorders become increasingly common as we get older? And, is there anything we can do to prevent or slow this process? 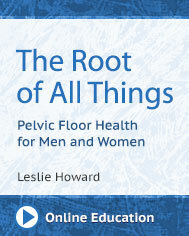 In this 2-part course, yoga teacher and yoga therapist Leslie Howard will discuss common male and female pelvic floor disorders and how yoga can offer an avenue to prevent these. This is a two hour webinar and also there is a bonus yoga class attached especially for men.